My kids from last year, kindergarden and following Summer Camps “Be the Explorer” and “Storybook Week”, have experienced with me such a special journey so far that I was asked to prepare some sort of course for their 1st-grade after school, this year, in Padua, Italy. I wondered what to do for a while, which would have been the best path to follow with them and then, during my English in Early Childhood course, I crashed into “Tell it Again”, a storytelling handbook for Primary English Language Teachers. That moment was definitely a WOW moment, given that I was really starting to go into storytelling and it seemed simply one of those things that happens at the right time. I studied it thoroughly, going through the methodology and the selection of stories, and then decided to make a storybook-based curriculum. 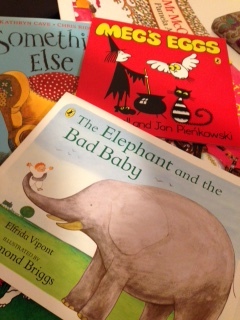 Throughout a six-month once a week period I’ve chosen 3 storybooks to spend 6 lessons each: My cat likes to hide in boxes, Megg’s Eggs and The Elephant and the Bad Baby. This will be a great journey for my little Italian English learners; a journey through different countries and cultures, through magic spells and prehistoric dinosaurs, and good manners also! All this, while introducing the past tense and being fluent in the present and eventually making predictions using the future. We’re going to start tomorrow, Monday the 30th. I’m super excited and literally can’t wait to hug my guys again and begin this new adventure together. Stay tuned and Learn along with us! How can we travel to Colombia?